Summer may be on the wane but for many of you, the weather will continue to be hot for at least another month so Adrienne of The Rich Life (on a budget) and I wanted to give the season a proper send-off by making this month’s “How I Wear My” all about sandals. 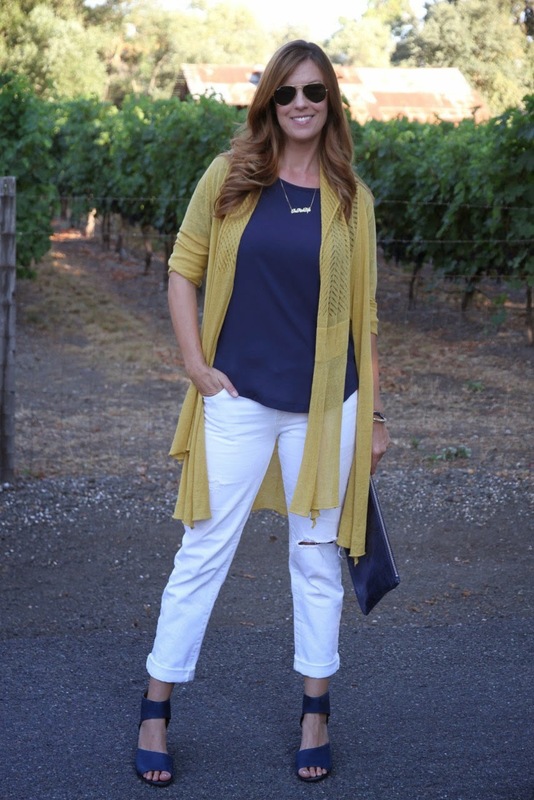 You may recognize the outfit that Adrienne, above, wore in a recent post about the color Misted Yellow. It features a Stella Carakasi Point of Interest cardigan in saffron. 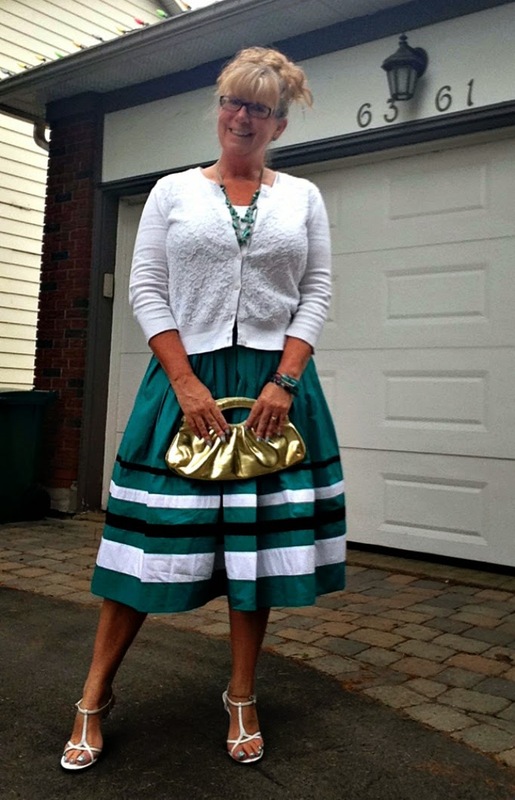 She decided to give it a different spin for “How I Wear My” and paired it with blue Franco Sarto sandals. 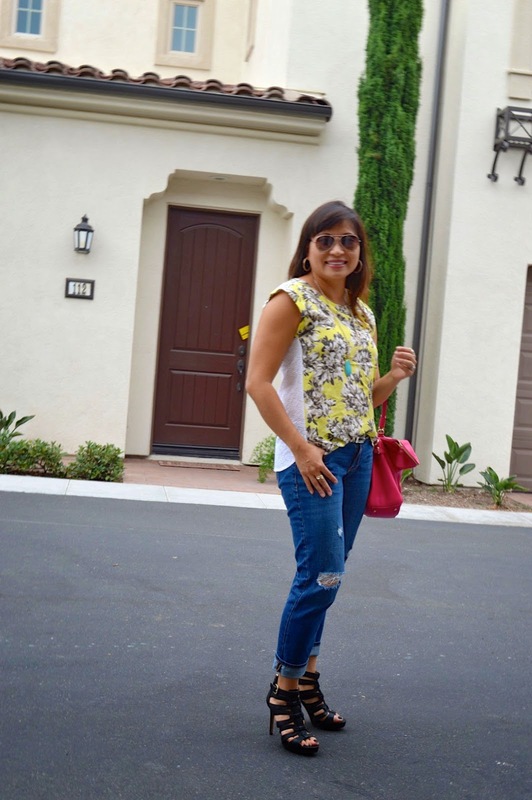 I think with the blue blouse, bag, and sandals, this is a great late summer look and Adrienne looks lovely in yellow! Delilah of Pumps & Studz. 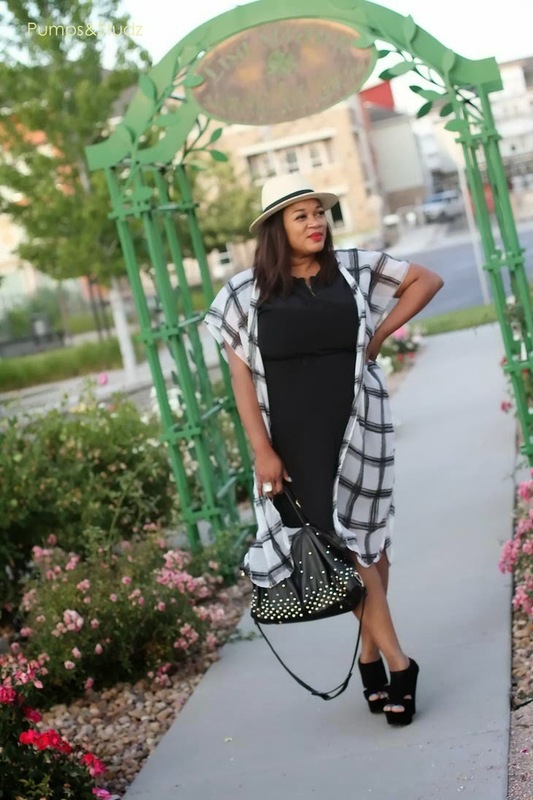 Delilah looks so beautiful in this ensemble—I love the dress with the black and white windowpane-print kimono over it, as well as the addition of the Fedora, a studded bag, and those wedge sandals (and the red lip). Perfection! This look is amazing on Cynthia and I love it all, from the outfit to the bag to the jewelry, sunglasses, and gladiators. So chic! Sheree of It’s Not That Deep offers one glamorous spin on palazzo pants. These are from TJ Maxx (wow!) and I adore how she has paired them with this long black BB Dakota vest and flat black sandals. Sigh, I wish Sheree was my personal stylist! A photo of Teresa by her husband, photographer Denton Taylor. 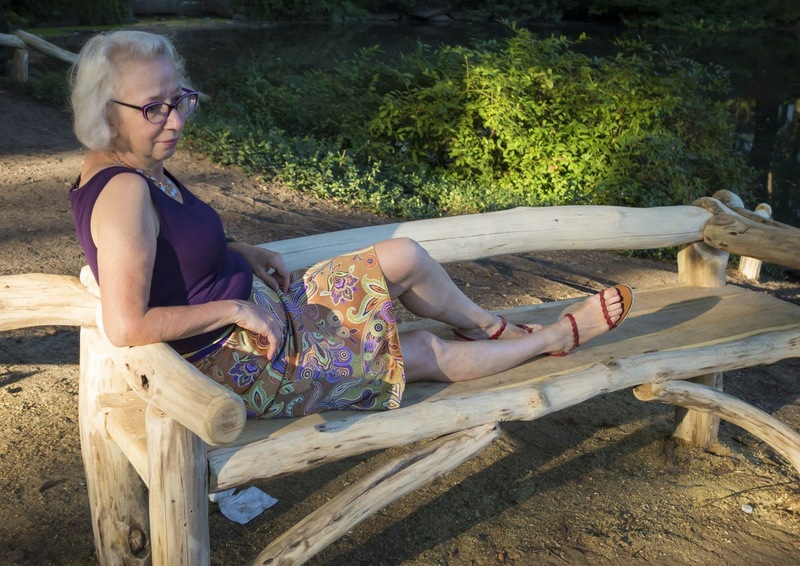 Teresa is wearing a new pair of Valentino sandals—so delicate and feminine—while she relaxes on a bench in Central Park in New York City. I love the deep purple of her blouse as well as that paisley and floral skirt! She is wearing a pair of neutral tone sandals with a gold block heel and I love the combination of the floral skirt (it almost looks like camouflage!) and the turban. The whole ensemble is modern Gloria Swanson, and like the divine Gloria, Trina is ready for her close-up! I do love the unexpected pairing of a deep olive green with a coral pink blazer and the sandals help take Ana’s entire outfit up a notch! What a fantastic look on Catherine. I don’t own any block-heeled sandals but Catherine’s outfit makes me want to change that right away! Speaking of California, Nora of Jacket Society chose a soft kimono jacket to wear over a black dress for a weekend stay in Palm Springs. I like the wide bands of her black sandals and that she added a long red clutch to this gorgeous ensemble. So do I, Dawn Lucy is looking smokin’ hot! I love T-strap shoes so much and I never get tired of seeing them but I notice that I hardly ever see them these days. I love these sandals (and that blue pedicure) on Alicia! They are perfect here with the Old Navy distressed jeans and J. Crew top, not to mention that great bag; I think of Alice as the Mix Master for a reason—what a way to combine the edgy and the sweet! 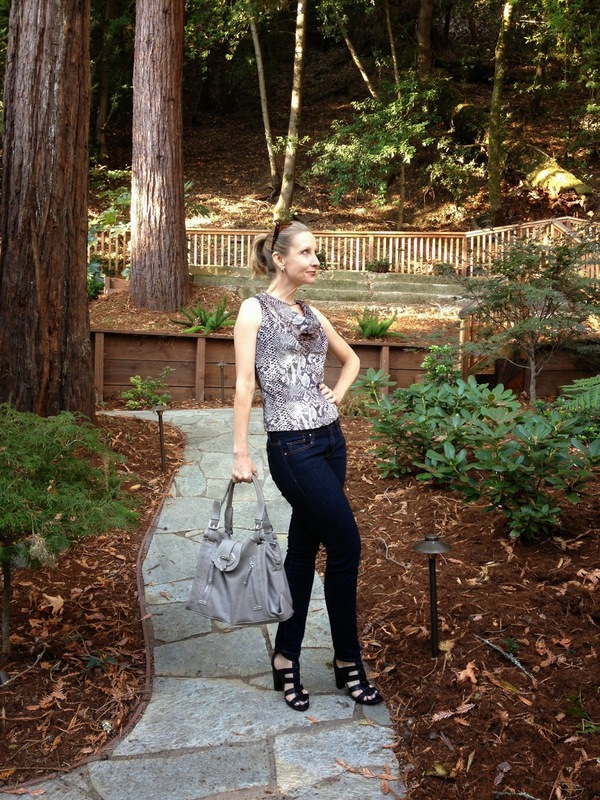 Susan of High Heels in the Wilderness is wearing a pair of black Michael Kors sandals that she searched for all spring. She said, “Now that I’ve found them I wear them with everything.” Here she’s paired them with an unusual and dynamic black and gold Elie Tahari top and pale cropped pants. I love a dark top with light trousers so I am a fan of this look! 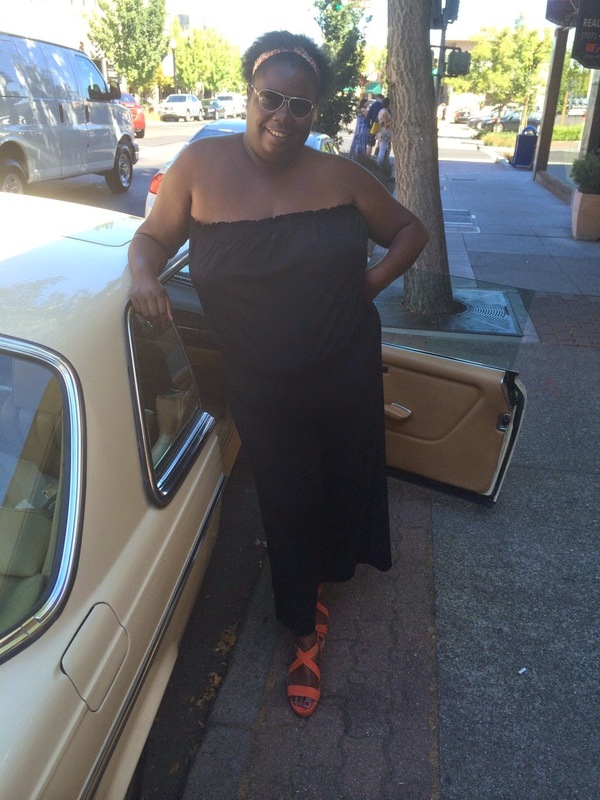 Malia of Style by Malia is wearing a super chic black strapless jumpsuit and fantastic orange wedge sandals by Sacha London. She should pile on about a million gold necklaces and go disco dancing in this ensemble! Do note her amazing 1981 Mercedes-Benz. I love a vintage Mercedes more than any other car and this one looks like a beauty. Side note, that car is named Dynasty! Love love love! She brings up a great point—it is worth spending the extra time and money to get a good pair of sandals because I’m with her, it’s annoying if they only last one season and even worse if they break down during the season! Do you take the time to find a great pair of sandals or are you more casual about your sandal shopping? 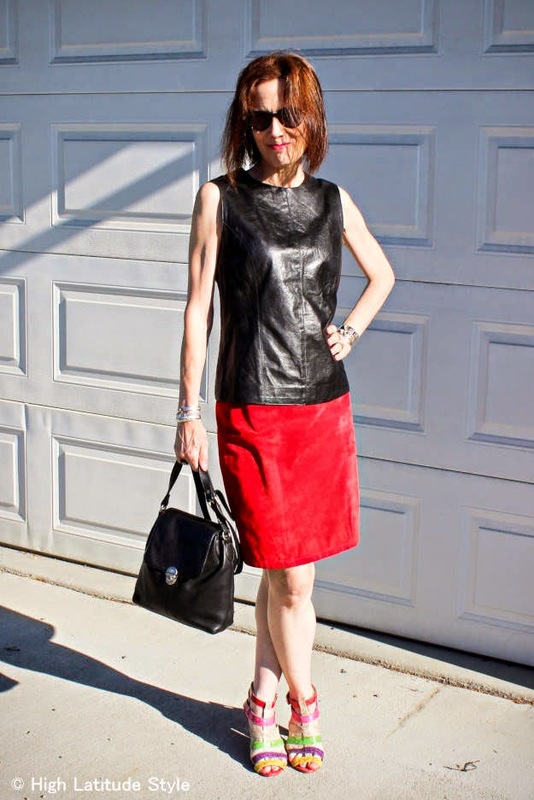 Nicole of High Latitude Style edges up a pair of feminine and fun multi-colored strappy sandals in an unexpected way, with a black leather sleeveless top and red skirt. I love the pattern on this floral frock, it makes me think of a beautiful impressionistic painting, and I like how the sandals are so simple, they let the dress take center stage. I am loving this ladylike vibe on Linda. She would look perfect at a Manhattan rooftop garden party in this ensemble, champagne cocktail in one hand, gold clutch in the other, while gazing at the sunset! The sandals sunk into the grass, for a close-up, see below! I admit I don’t wear a lot of sandals during the summer—I’m pretty tied to my Skechers sneakers since I’m spending so much time with my kids, sometimes literally chasing them around. Most of my sandal wearing is at night when I go out with friends. 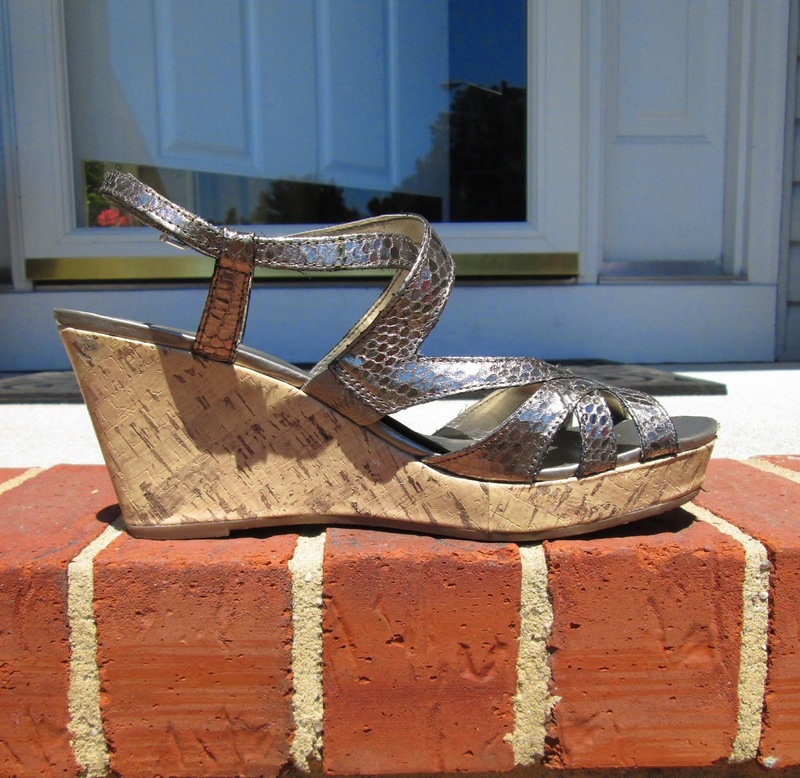 I never get tired of a 70s vibe so I adore these Kelly & Katie snakeprint metallic strappy wedge sandals that I picked up at DSW a couple of years ago. They are high, about three inches tall, but surprisingly comfortable! I was still in Virginia when these pictures were taken so I didn’t have a lot of clothing options with me. This look was a study in Working with What You’ve Got, the One Tiny Suitcase Edition! I paired a J. Crew sequin cardigan with an ombré Old Navy tank that goes from white to gray, which I love. I am also wearing J. Crew khakis. They weren’t long enough to go down to the edge of the sandals so I turned them into cropped pants by flipping up the hems. Kelly & Katie sandal from DSW. L’Wren Scott sunglasses, Julie Vos stacking rings and Pippa pendant, Timex watch. I am wearing a Julie Vos Pippa pendant in sapphire blue and silver stacking rings. The sunglasses are my new favorites by L’Wren Scott and if you like them get thee to eBay, I recently saw an auction for the same pair. They have a lovely scrolled detailing which I just adore and which gives them a vintage Old Hollywood feel. I hope you are enjoying all your sandals right now, while the weather is still warm enough to wear them! As you start to think about your fall wardrobe, it’s only natural that you will be reaching for items in your preferred shades for autumn. So please join us for “How I Wear My: Favorite Color.” Whether you adore ravishing red, harvest orange, or the deepest of blue, purple or green, we would love to see you in whatever color you love best! Pictures are due by September 29, 2014. Send them to us at howiwearmy@yahoo.com. Do stop by Adrienne’s to see even more great looks featuring sandals. So many great sandal looks! I love what you created out of your small travel wardrobe. Off to eBay to look for those sunnies. Thanks for another great HIMW! I am already excited about next month's Favorite Color! So many great looks in both of these posts! Thanks for hosting, Jill and Adrienne! A nice round up of fashion snaps...so happy that you two busy ladies are still devoted to sharing these themed posts. I love that you have some newbies here. Great descriptions as usual Jill. Thanks again for hosting such a fun series. Thanks for featuring me on this post. I have been following it for awhile and in the past have missed the deadline. I love the diversity of looks shown and the fact that you have introduced me to some new bloggers to follow. Thanks again! This is just awesome! Love all the different looks and how this series continue to grow! Thank you for hosting a great series. Another great month with great looks from fabulous ladies, looking forward to next month's. Thanks so much for hosting this. What a great post! Lots of ideas here. I am a high heeled girl a heart being only 5-2 but i do wear flats with shorts. High heels and shorts on me would look ridiculous! Nice silver sandals! Everyone looks great! Many great great strappy numbers here. It was one last look of summer for me as we head into Fall and boots and layers. Everybody looks great here and I love your DSW wedges, Jill. Looking forward to favorite colors. Another fantastic edition! 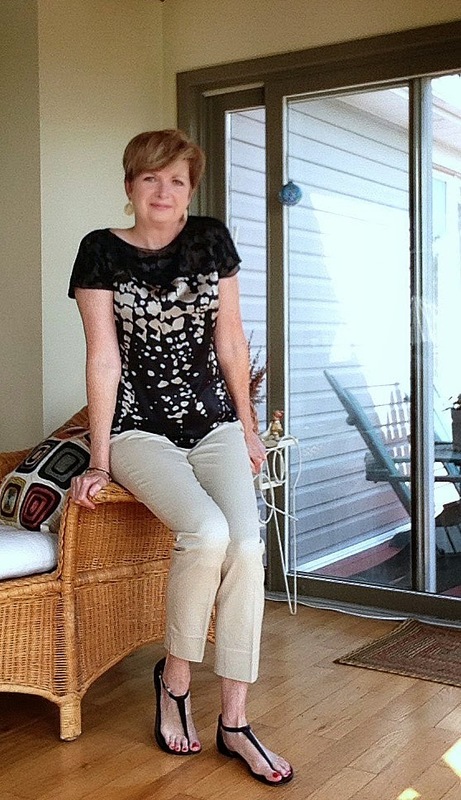 Thank you for including me :-) Jill I love your casual with a touch of glam look - it's perfect for time away from home. Love Adrienne's fresh colour blocking. I'm referencing these posts for inspiration! I applaud all of the ladies! 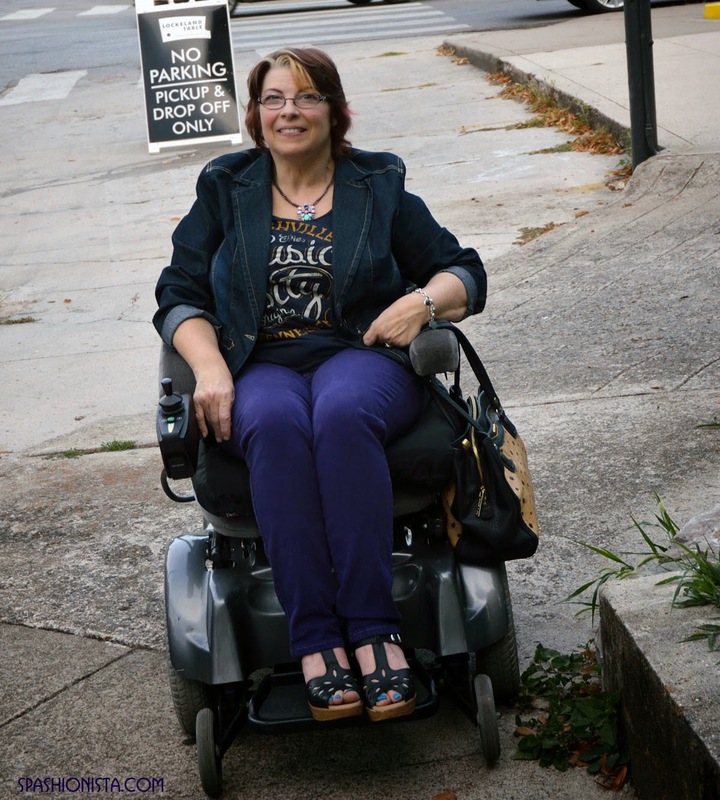 I think they look great,and I think your blog is such fun. I wish I were brave enough to participate. lol.